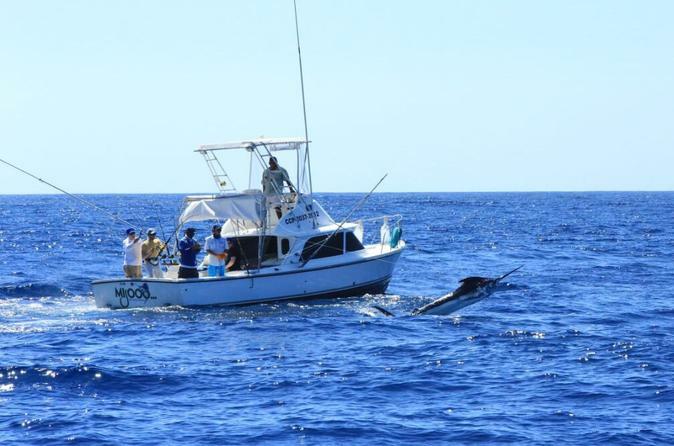 This tour will take you into the waters of the Guatemalan Pacific Ocean to fish for sailfish, mahi mahi and tuna. Enjoy an exciting day fishing in the hottest spot on the planet for sailfish, and eat fresh ceviche or sashimi, depending on the catch of the day! Guatemala is known in the world as being the hottest spot on the planet for raising sailfish, with unequaled numbers anywhere else in the world. Tour includes transportation from Guatemala City. We'll pick you and your group up at your hotel(s) and drive you down to Marina Pez Vela where we'll board a Bertram 31 fly-bridge and start our day! This tour includes meals, beverages and snacks on board as well as all of the equipment needed to go fishing. You just need to show up with comfortable clothing and sunblock and we will make sure to put you on the fish so you may enjoy a day not likely to be easily forgotten.